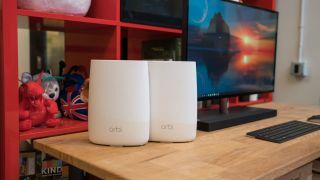 The Netgear Orbi mesh Wi-Fi router system is a brilliant setup for expanding fast Wi-Fi throughout your home, and now Amazon has cut up to £200 off various models for Black Friday. The biggest saving is for a two pack of the Orbi RBK50, which knocks the price down from £399 to £199.99, making it one of the most affordable ways to get this system. It comes with a router and a satellite which can be positioned in your home to offer up to 4000 square feet of coverage. A user-friendly app lets you set up these devices with ease, and they also feature Alexa compatibility for voice control. This is an absolutely brilliant deal, but it only lasts until midnight tonight (November 23), so don't leave it too late to take advantage of this deal.